XI Class College Transfer Notice 2018-2019: Mymensingh Education Board has published their XI Class College Transfer (TC) Notice 2018-19. Mymensingh Education Board is the Ninth Education Board of Bangladesh. They have published their first XI Class TC Notice 2018-19. Mymensingh Education Board has many students study in the Xi Class in college and some students want to change their college. The Bangladesh Education Board provides a legal way to transfer from present college to his/her favorite or, target college. The main important question of all the Eleven Class students, when the Bangladesh Education Board starts XI Class TC System. 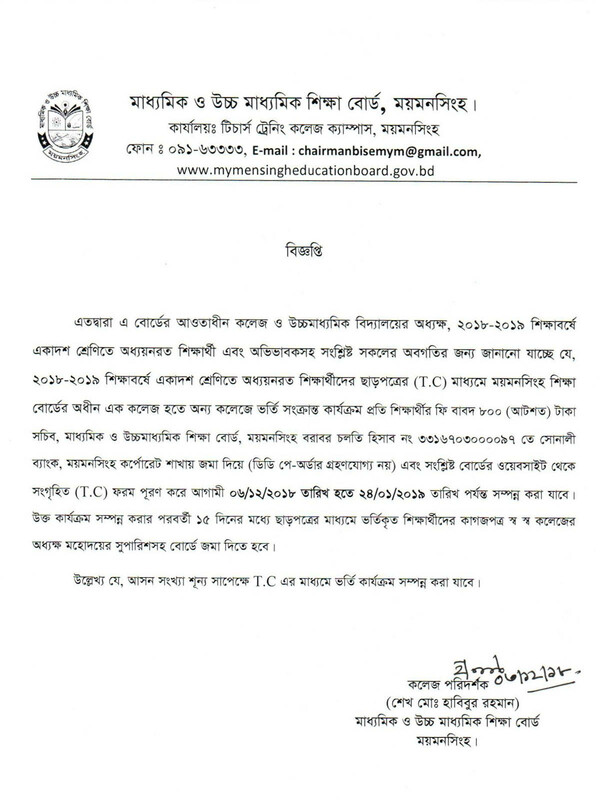 Mymensingh Education Board XI Class College TC will start from 6th November 2018 and runs 24th January 2019. Under this time, Xi class 11 students change his/her college by following below condition. Are you searching 11 Class College Transfer Notice Session 2018-2019 PDF File, Image, Picture to get a clear idea about the college 11 class TC System? Here the below Full XI Class TC Notice PDF File. Mymensingh Education Board has some rules to apply for Transfer College in the XI Class. Below this to the way a step by step of how to apply for XI class TC application 2018-2019. visit the website: https://www.mymensingheducationboard.gov.bd/. If you are trying to new applications for College Transfer, you should register with your following information.